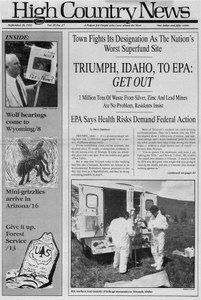 Locals balk at EPA's plan to declare Triumph, Idaho, a Superfund site due to mining waste. Idaho Department of Health and Welfare report on arsenic and lead levels in blood samples of Triumph residents suggests no need for concern. Profile of Triumph, an Idaho town that could be declared a Superfund site by the EPA. State struggles to find money to pay for the tailings cleanup at Triumph, Idaho. The author describes the perils of living in the land of killer bees. Stone Forest Industries blames environmental groups and the Forest Service for its mill closing when company management is really to blame. Toward a New Direction: Social Justice, Race and the Environment focuses on links between pollution and poverty. Former government biologist, Mark Shaffer, proposes the Endangered Species Act be extended to include entire ecosystems called lifelands. A book review of "Los Angeles: Capital of the Third World' by David Rieff. An annual conservation congress will focus on "Our Forests, Our Future." The U.S. Fish and Wildlife Service wants to remove all livestock from an antelope refuge in order to conduct an ecosystem management restoration program. The Department of the Interior is writing new rules to interpret an 1866 mining law concerning road-building. The fourth annual Headwaters conference explores Western culture and colonization. Animal Damage Control will change its name to Wildlife Services. Senator Ben Nighthorse Campbell proposes a bill that would force the Washington Redskins to change their name. An advocacy group's efforts to protect the Black Hill's ecosystem from too much logging is hindered by a lack of scientific data. A jury acquits rancher Paul Berger of charges that he poisoned eagles in Montana. The first two people convicted under federal tree-spiking laws will spend time behind bars. Bureau of Reclamation Commissioner Dan Beard invites two Ute tribes to take over the Animas-La Plata water diversion project. Several land-use bills cause division and compromise among wise-use and environmental groups in Oregon's state legislature. The Bureau of Land Management withdraws 20,000 acres of Sweetgrass Hills, a Native American spiritual site, from mineral development for two years. Mattell introduces a "Native American Barbie" doll. The Central Arizona Project's water price will skyrocket, costing stockholders millions. Though the Yellowstone forest recovery is well under way, moose still suffer. The EPA cites a Montana mine for seven violations of the Clean Water Act. Protesters at hearings throughout Wyoming demonstrate against wolf reintroduction in Yellowstone. A wolf is shot illegally in Montana. HCN publisher, Ed Marston, recommends that we abolish the Forest Service. The Forest Service's plans to build a campground and trade land with developers galvanize resistance residents of Sedona and Prescott, Ariz.